Designs that shine – and function damn well to boot. Our dev team eats landing pages for breakfast and web applications for dessert. We’re capable of fully customized builds that incorporate whatever integrated application your company needs to operate and thrive. Whether it’s a simple landing page or a robust brand portal, we’ll do things with code that would make Neo from The Matrix jealous. In the digital era, a website is equivalent to a storefront. Just as you wouldn’t want a cluttered, confusing storefront, you don’t want a website that confuses or overwhelms your customers. Whether you’re looking to move product, generate leads, or simply provide information, a clean design is essential to a well-functioning website. Web development has come a long way from the early days of raw HTML. Graphic designers with limited programming experience can create imaginative designs before working with a web developer to create a finished product. We also ensure that any copy on your website is compelling and engaging, as we avoid using common cliches or cookie-cutter copy. We use innovative Adobe software to implement creative graphic design principles to ensure a quality aesthetic before we send designs to our web development team. From there we work with the client and the development team to create the perfect website. We also have experience utilizing digital tactics to correspond with our web development skill set. We can create geotags that deliver your customers straight to a landing page that appeals directly to their needs. We can even build out a network of landing pages that target different aspects of the demographic you’re targeting. And because you no longer need to be a web developer to design a website, we can offer simple websites and landing pages at a fraction of the cost of hiring a typical development team. By combining the creativity of our graphic designers with the clever functionality skills of our web developers, we create websites that offer the ultimate combination of aesthetics and utility. Bluhawk, a new mixed-use development in Overland Park, Kansas, is taking the combination of work and play to new level. 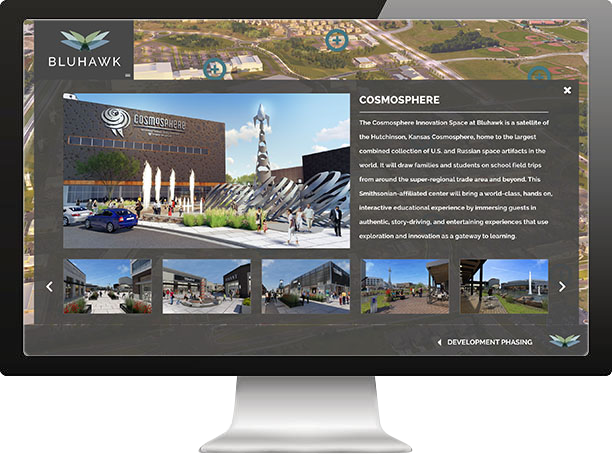 To showcase their unique features, like The Cosmosphere Innovation Space, we created an interactive, virtual map for users to explore. 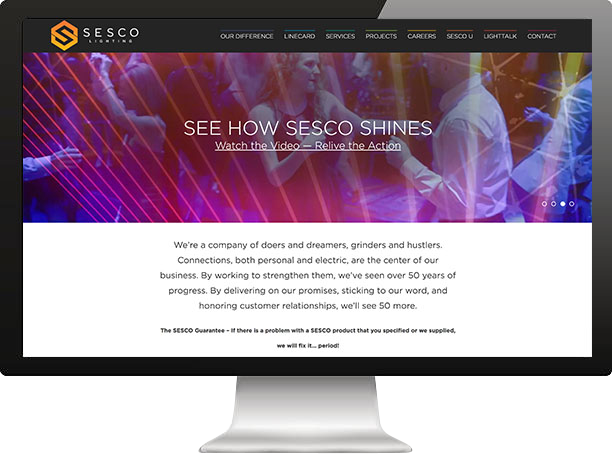 SESCO Lighting, a commercial lighting manufacturer with locations across the southeast, needed a website that reflects their bright brand. FMG designed and developed a website of bright colors, SEO-friendly copy, and an interactive Linecard for each location. Gainesville's newest Mixed-Use Development, Celebration Pointe, is home to shops, restaurants, offices, and the area’s first state-of-the-art luxury-seating movie theatre. 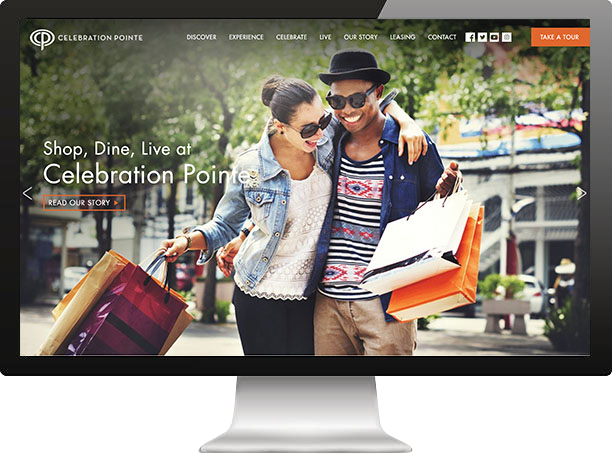 For Celebration Pointe's internet presence, we designed and developed a website full of life and information. 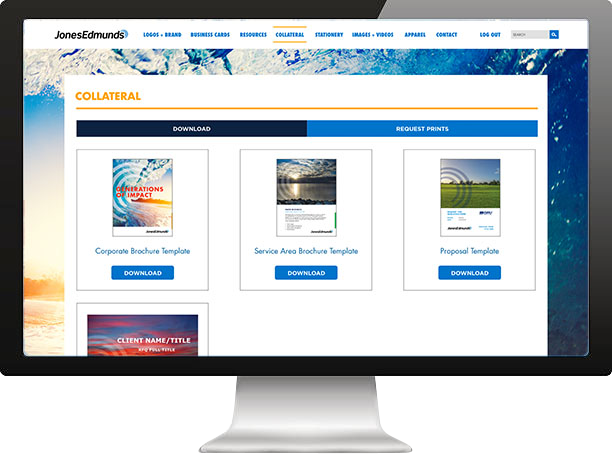 Internal facing Brand Portals are the perfect place for companies to house downloadable content, event photographs, and product order forms for employees, all housed safely behind a password-protected login.